If England's Saturday defeat by the 'Boks wasn't bad enough, Saracens went and "did an England" on me on Sunday too - they threw away a perfectly good 17-3 half-time lead, and lost to Worcester 20-17! And so finally this week, Andy Robinson has done the decent thing and resigned. I'm sure he's a very nice bloke, but he seemed to be out of his depth as coach, and I'm afraid England's results under his tenure do nothing to dispel this observation. Corry's captaincy looks unlikely to run into the Six Nations, either. And we're in trouble with regards quality Centres and Fly Halves. Interestingly, Saracens' French back Thomas Castaignede thinks Farrell could be the next Will Greenwood. It was good to see Thomas playing for Sarries again [see right] on Sunday, after his spell out with injury and Interntational duty. 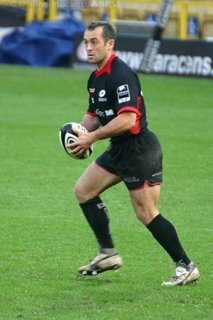 Another welcome comeback will be that of Richard Hill, who is now fully fit and selected for Saracens team against Wasps tomorrow, after his 2005 Lions injury nightmare. Sarries field an unchanged team for the match against Worcester. Let's hope they can do as good a number on them as they did last weekend at Northampton. Farrell has looked far more convincing (in the games I've seen him in) at 12 rather than 6. Anyway, Kiwi Zinzan Brooke says he would give Andy Robinson and Martin Corry the chop, if he was in charge at the RFU. The only problem is, who would replace them? There's no obvious candidate for either post at the moment, or I suspect they would have the job by now. Let's wait to see what the weekend brings! Maybe Josh Lewsey is doing some up-front damage limitation by claiming that "people are naive if they expect us to rip the Boks apart". Well, Josh, we might not expect it, but it wouldn't half be nice if you did! Now, we have to look forward to the weekend's games and dream about what it would be like if we were still ranked #1! Andy Robinson's picked the team for Round 2 against the Springboks, and he expects great things of Andy Goode. 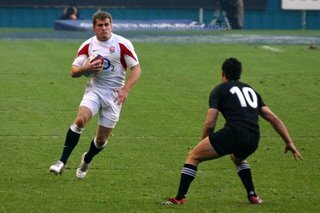 We certainly need a solid contender for the Number 10 shirt, now that Charlie Hodgson has joined Jonny in the injury camp. Sheridan's also got an extended time off with injury - so that's three Sale big hitters now on the sidelines - Scotland back rower Jason White also sustained a serious knock during the game against the Pacific Islands, and is out for at least nine months. Sale must be worried that this triple whammy could well hinder their Guinness Premiership title defence. As you can see, Sarries are not short of point-scoring ability either - they have the biggest tally so far, and fly-half Glen Jackson is the top points scorer in the Premiership (for the second year running) - he's currently on 116 to Charlie Hodgson's 80, and poor old Charlie is unlikely to be scoring any more this season. Bath and Worcester are struggling at the bottom of the table - Bath having only won two games out of 8 so far, and Worcester none. Something had to give - Worcester have just announced they've parted company with coach Anthony Eddy. More good news for Sarries, perhaps, as they are playing Worcester on Sunday at home. I'll be at the match and will post some photos as soon as I can. Wales should head into their clash against the All Blacks next weekend with bags of confidence. And Argentina made it two in a row with a 16-23 victory against Italy at the Stadio Flaminio. Quite a turnaround as the South Americans were trailing 9-3 at half time. Surely, this win (and last week's) proves that Argentina deserve a crack at bigger competitions - either the Six Nations or Tri-Nations. There's certainly debate to that effect at the BBC Sport Editor's blog. And I agree. Whilst there, I also stumbled across a really interesting piece about the role of the 4th TMO, especially with regards to Noon's try which was disallowed against New Zealand. Food for thought! Northampton were beaten 13-35 at home by a firing Saracens team. The Men In Black scored five times. Glen Jackson landed all his conversions, Andy Farrell scored his first Premiership try, and Neil de Kock crossed the whitewash again for his third try in a month. This gives Sarries another bonus point which will hopefully see them rise up the table, if not this weekend, then it may well be a vital point later in the season. "It's the worst performance at home since I've been here. We couldn't catch the ball, we couldn't pass the ball twice and we dropped the ball. It was terrible. We made too many mistakes." Quins saw Worcester off 20-6 at home. Poor old Worcester have now lost 8 in a row, and are camped securely in the relegation zone. Quins know all about that, of course, as they spent last season in National Division 1. Saracens kept up a good home record at the weekend by beating Leicester Tigers 22-16, in a fast, exciting game. Sarries attacked right from kickoff and kept up the pressure throughout the game. Admittedly, the Tigers were without some of their regulary guys who away on international duties, but they still put up a good fight. See more of my photos from this game at rugbypix.com. 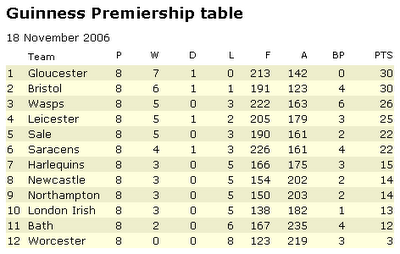 Sarries are now 6th in the Premiership table, the highest they have been placed since about this time last year. Let's hope they can remain bouyant! Heading the other way, there is much talk of Andy Robinson's position in light of the recent loss against Argentina. Seems he has a stay of execution until after the South Africa games are done. Messers Guscott & Healey would have him go now. They make some compelling arguments, in my view. Argentina have pulled off the win of their lives and beaten England 18-25 at Twickenham, their first win at the ground. It was only a matter of time, really, as they have been getting stronger as a team for a while now. I didn't watch the game, and have only read reviews of it, but it sounds like England were their own worst enemies. They just can't seem to fire as a unit. BBC Sport gives the England player ratings. Corry says the players are to blame, and Robinson's vowed not to quit. But what will it take for the team to pull their socks up? I suppose one face-saving fact is that we didn't get the thumping from the All Blacks last week that France endured this weekend... They went down 3-47 in Paris, only managing one drop goal to the AB's seven tries. Merde encoure! Meanwhile, Ireland beat the Springboks 32-15, so South Africa will be coming to Twickenham next weekend, looking to put some points on the board with even more determination. Let's hope the pain doesn't continue... not sure if I can watch! 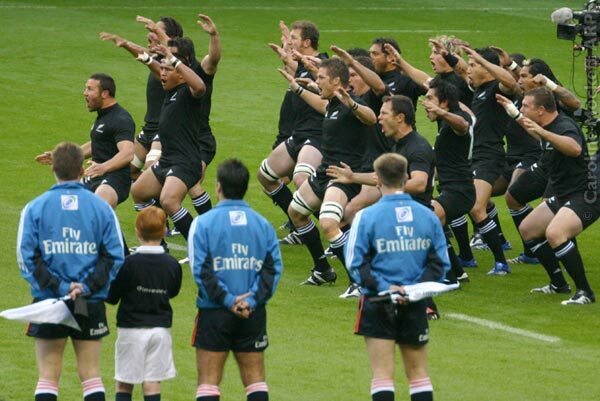 So the mighty All Blacks came and squashed all before them at Twickenham. England suffered their biggest defeat on home turf by going down 20-41 to New Zealand on Bonfire Night. What went wrong for England? Well, I didn't actually think they played really badly, they just didn't clean up as well as the ABs - any mistake and they make you pay, usually with 7 points! We gave away five penalties but scored as many tries as they did - unfortunately, ref M. Jutge didn't quite see it that way and disallowed Jamie Noon's perfectly good first try. The Ref's boss agreed it was a try after the match. 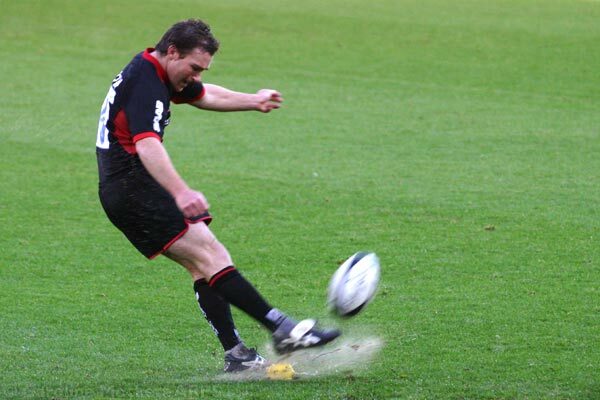 Plus Dan Carter's boot rarely let him down - so the penalties were made to count. As for the newbies; Shaun Perry looked good at No. 9, and scoring a try on your debut ain't bad either. He and replacement Pete Richards both looked more lively than I've seen say, Harry Ellis, in an England shirt recently. I hope they can both make a go of it - a rivalry like the one between Dawson and Kyran Bracken could only be good for the Scrummies, I say. Paul Sackey burned up the turf when he got the ball. Not often enough, sadly. 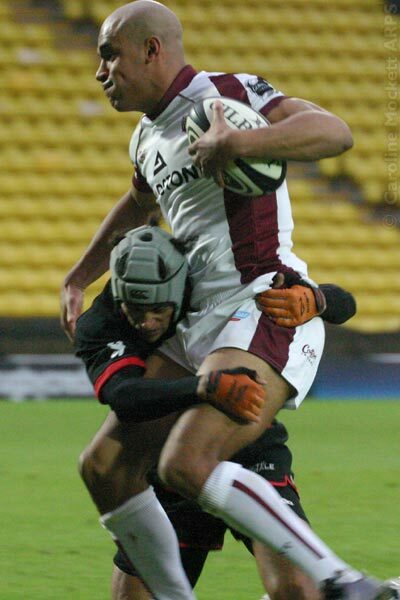 And Anthony Allen did OK too - even though it was his wayward pass that gifted Joe Rokocoko a try. Let's face it, if it wasn't Allen, it probably would have been someone else! And he was certainly making and taking plenty of big hits, even on guys twice his size. Brian Ashton was pleased with the new guys , at any rate. The front row boys, Sheridan, Chuter & White (sounds like a dodgy car-dealership!) are usually renowned for their dominance up front, but Messers Woodcock and Hayman were shoving as good as they got - and often better. 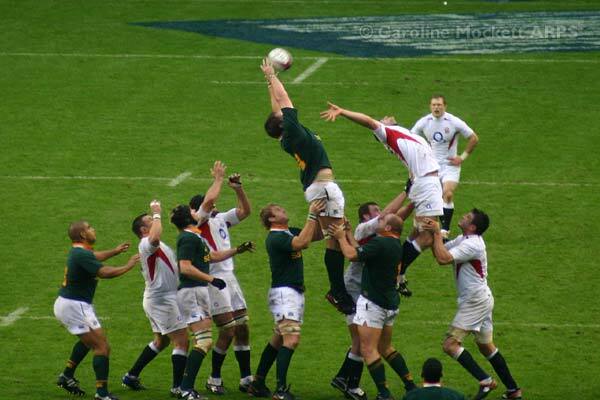 From memory, I don't think the lineout was too shakey; Ben Kay and Danny Grewcock seemed to have that mostly sewn up. Pity they couldn't steal a few more though. Lewis Moody chased round the pitch after everything, as usual! BBC Sport gives them all points out of ten. I've plenty more photos from the game at rugbypix.com. So next weekend, we have the Pumas. Another team who will give us a run for our money. Look how they held off the Lions to a draw last year. It was only Jonny's last-minute penalty that saved face at the Millennium Stadium. I'm not going to that game, but will be along to see Sarries vs Leicester in Watford on Sunday. Will report back later! Impossible job? Mike Ford, England's defence coach, has one of the toughest jobs in rugby right now. Let's hope he's been doing his homework! Two guys that we will miss on the pitch, and won't be able to renew their sparring from last year (see above) are Mark Cueto and Dan Carter. Cueto failed to recover from injury sustained in a Heineken Cup game against the Ospreys. Carter, meanwhile, is rested by Graham Henry ahead of the All Blacks' games against France and Wales. Nick Evans gets the nod at No. 10. England 'had to gamble on youth' - Shaun Perry (left) and Anthony Allen win their first caps against the All Blacks - what a baptism of fire! And Paul Sackey is primed for his England chance to impress. He certainly flies for Wasps on the Wing. Old boy Iain Balshaw is shocked by his England chance at Fullback. I'm sure he'll make the most of it. And talking of renaissances, lock Ben Kay has recently found his form again. All in all, Graham Henry expects England to come out on the attack when they take the field in front of a record 82,000 fans on Sunday. Jonny Wilkinson is set for his latest comeback - how many is that now? Hilly scored a try during his first match for Saracens in their Guinness A League defeat of Northampton, 43-12.And Dallaglio thinks if he doesn't get picked for the Six Nations squad next year, he's probably blown his chance at another pop at the World Cup. The underdogs can triumph on the day - as Australia found out to their cost when they were beaten by the Ospreys last night! Well done, guys!